The band’s first producer, Gus Dudgeon, described Heron as ‘English pastoral, with a sunny, summer’s day feel.’ Few bands can be more deserving of that label as Heron actually recorded their two albums in fields (two different ones, in fact). You can hear the birdsong, the summer’s breeze and, at one point, what sounds like the lazy drone of a light aircraft. The background sounds were miked separately and then ‘dirtied up’ for added authenticity. The mood is very much early ‘70s natural and organic – a little band banter here and there (‘little black things crawling all over me’), adjusting the mike at start of Carnival and Penitence. The music is very much of its time too – quintessential English folk with gentle harmonies, a homely, rustic feel conveying simple pleasures and universal themes in sun-dappled hues. It is music to bask in or nestle amongst – intimate, melancholy at times, wistful at others, sometimes gently humorous too. There is a thematic undercurrent of life’s ephemerality as measured by the passing days and changing seasons – ‘You may go to chase the sun or vanish in its changes’ (from Smiling Ladies). Hailing from Berkshire, the mainstays of the band during 1970-72 were Tony Pook (vocals), Roy Apps (guitar, vocals), Gerald ‘G.T.’ Moore (guitar, mandolin, vocals) and Steve Jones (keyboards). Apps and Moore (writing separately) provided most of the material. Surprisingly, perhaps, Moore had a background in local soul band Gerald T. Moore and The Memphis Gents. Heron got a record deal via Donovan’s original producer Peter Eden, at progressive label Dawn in 1970. They recorded two songs for a prospective single at Pye in July of that year. They hated the sterility of the studio, preferring a relaxed approach with live audience interaction and to be ‘down by the lake in August, rolling in the leaves.’ So when it came to their Dawn album, they took off to Appleford in Berkshire (coincidentally not far from Traffic’s ‘place in the country’) staying at the farmhouse where Tony Pook’s family lived and recording the whole thing in a field at the back of the farm. The setting doubtless gave rise to Apps’ evocative ‘sitting in your mother’s garden smoking Lebanese beneath the privet hedge’ (Upon Reflection). 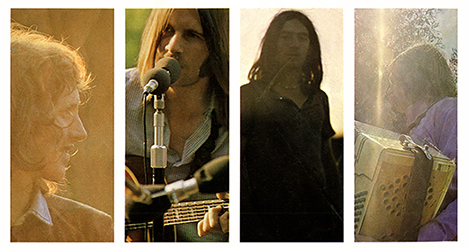 The resulting album, Heron [Nov 1970], has strands of Dylan and The Incredible String Band running through its veins. Together, the thirteen songs form a remarkably even folk-rock template. There is discipline behind the spontaneity and an intent to the material which gives Heron a uniformly thoughtful quality. Yellow Roses is a fine opener and Car Crash tells a chance tale of true love mingling memory, fantasy and longing. There is perhaps a Joni Mitchellinfluence in lyrics such as ‘strikes shadows in the dancing, glancing, taunting vein that frees the air’. Harlequin 2 has an enjoyably diverse approach to instrumentation and vocals whilst Little Boy and Little Angel show a melodicism and potential for a Matthews Southern Comfort-like smoothness. Lord and Master is the wintry standout, beguiling, quietly yearning and hooky in its way with its themes of a handed-on connectiveness – ‘ I am a lover of everything and I walk with a friend of the trees’ – linked by melancholy – ‘the sky it longs for the sun’. ‘Lord and Master’ would be a good entry point for anyone unfamiliar with Heron (unless you’re a committed folkie in which case, dive in). Heron took part in the Penny Dawn Concerts Tour (four Dawn bands for one old penny!). Roy Apps recalls the rapturous reception they received from an audience of three thousand in Bristol but generally the band felt their quieter style was better suited to more intimate venues. Despite a Radio 1 session in January 1971, still Heron failed to break through. April 1971 brought a maxi-single. The rootsy rock of Bye and Bye (Tony Blackburn’s record of the week) and Through Time hints at more diverse musical flavours to come. Sales of the single were not helped by a ‘vinyl problem’ and strike of delivery van drivers. These kinds of incidental yet crucial circumstances frustrated the hopes of so many artists and bands in the ‘60s and ‘70s. Second album Twice as Nice and Half the Price [Oct 1971] was a double-LP recorded in the gardens of a gamekeeper’s cottage south of the village of Black Dog, Devon. The sound is fuller here thanks to additional bass, drums, electric guitar and slide guitar but its twenty-one songs tend to sacrifice the substance of melody and song structure for texture, playfulness, performance and ‘being in the moment’. Perhaps they were inspired by a lovely line from first album’s ‘Smiling Ladies’ – ‘I will sing until the music has no edges’. Although its title suggests a gesture of hippy generosity, Twice as Nice… was undermined by its length and the inclusion of some excessively ragged tracks, even allowing for an overall woody charm. A single LP would have made for a far more satisfying record though, even then, not as strong as its predecessor. The undercooked calypso lilt of album opener, Madman, references Moore’s broader musical aspirations whilst introducing the album’s raggle-taggle flavour; the song descends into a chaotic scramble of yelps, chatter and twangy guitars. Love 13 (lone) opens with an enticing shimmer but the vaguely McCartneyesque melody which follows is disappointingly underdeveloped. Likewise, Your Love and Mine has the hint of a decent tune allowed to slip away. I rather like Miss Kiss with its endearing kookiness and hints of classicism whilst John Brown is a respectable yet affecting cover of the 12-verse early Dylan protest song. For me, the album sags around the lengthy Winter Harlequin and The Sound of the Music, both doubtless fun to play. Closing track Harlequin 5 successfully nails Heron’s playfulness whilst Pook’s The Wanderer is a thoughtful highlight (‘Heed the flying of the water birds, They will show you who to be’.) With its ramshackle, rootsy rumbustuousness, Twice as Nice… always has its heart in the right place. And when you see the cover (band gathering outside the warm yellow ochre farmhouse – it’s on their website) you warm to it even more. If It’s Love, a stray track from 1972 which closes CD 1, is a surprisingly commercial proposition with an almost chewy early Badfinger-like quality and My Turn to Cry could have been a breakthrough single. The band split in 1972 though members pursued musical ventures in various guises. Interest in the band burgeoned in the ‘90s and in 1997 Heron returned to Black Dog for a reunion album, (Gerry Power replacing Moor) and a second farewell concert for the villagers, twenty-six years after the first one. A video/DVD release followed in its wake. This twin CD set gathers together all their Dawn recordings, forty-three tracks in all, including previously unreleased material (Rosalind), making it as comprehensive as any Heron anthology could be (saving recovery of long lostFriend from 1971). There is a nice colour foldout with archive pictures and informative commentary from David Wells. If, like me, you are stuck in the heat of the city looking for a little bucolic bliss, this could be your way out.